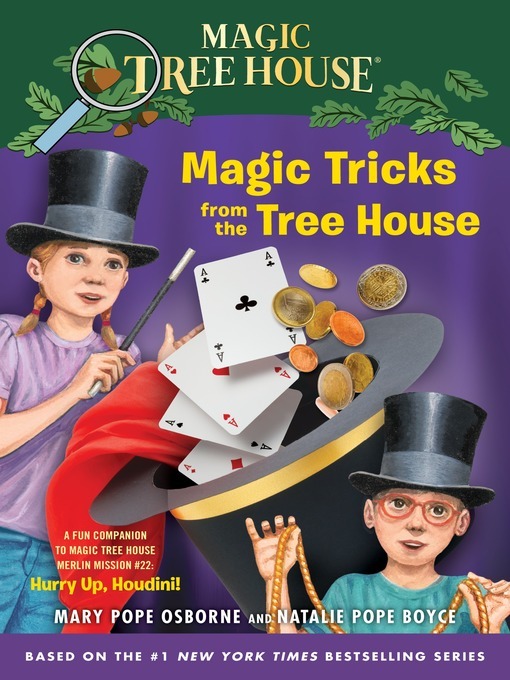 Title Magic tricks from the tree house [electronic resource] : a fun companion to Magic Tree House #50 : hurry up, Houdini! / by Mary Pope Osborne and Natalie Pope Boyce ; illustrated by Sal Murdocca. Imprint New York : Random House, c2013. Osborne, Mary Pope. Magic tree house series. Summary A chapter-book companion to the fiftieth Magic Tree House adventure outlines how to perform basic magic tricks and is complemented by facts about famous historical magicians. Note Description based on vendor-supplied metadata. Subject Magic tricks -- Juvenile literature. Osborne, Mary Pope. Hurry up, Houdini!